Q. When do we typically leave? The suns rays can be pretty strong on the water, so sunscreen and sunglasses are always helpful. If you are between 18 and 65, it's required by law. recommend a 55 quart cooler to take your catch home. If you want pictures of your catch, or video of your big fight, don't forget your devices at home! medication (taken ahead of time) to ensure that you get the most of your day! Q. What won't I need to bring? A. You won't need rods, reels or tackle. Life jackets are also provided, but if you have one you like to use instead, be our guest! leave that kind of work to your Captain! Q. What kind of fish will we catch? A. On a salmon fishing adventure, you may catch SALMON: Chinook, Coho or Atlantic , or TROUT: Rainbow, Brown or Lake Trout. On your walleye fishing adventure, you may catch Walleye, Northern Pike, or Freshwater Drum. Q. 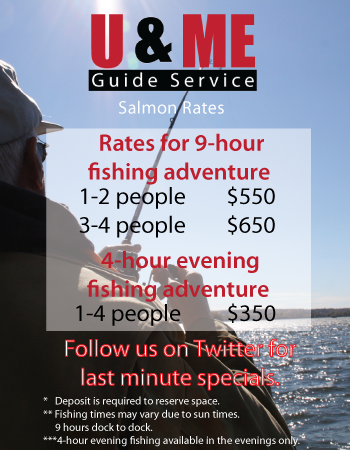 How much does it cost to fish with U and Me Guide Service? A. 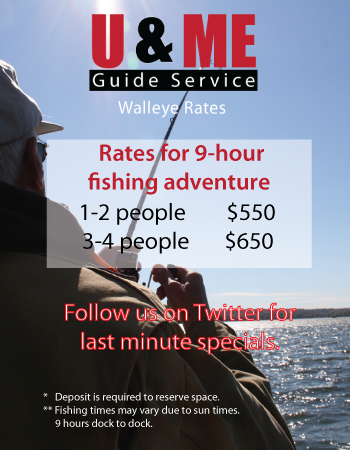 Check out our rates for salmon and walleye charters. Our prices include a full day of fishing, and fish cleaning at no additional cost. just ask us for more information! A. Yes, we do.Cancellation policy: 30 days notice for refund of deposit. If date can be re-booked, a full refund can be applied to the new booking.